Description: Zool 2 was a platformer that only appeared on a few game systems. Was a pretty popular game for MS-DOS PC's and the Atari Jaguar also received a great port of the game. 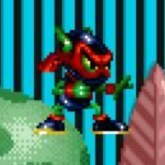 In Zool 2 the player plays as a gremlin ninja known as Zool. Along with his female friend Zooz and his dog Zoon they are on a quest to save the galaxy and defeat the evil Krool enemies. I always loved the levels and all the Lollipops in this game. NOTE: if you make it to the end of the level there will be smile ball, you cant pass the level unless you have 99 candies collected. Yep this game is hard! Game Controls: Enter Key = Start Button. Arrow Keys = Move. "X" Key = Attack/Shoot. "C" Key = Open Doors. Select the option icons located at the bottom of the game screen to edit controls, Play In Full Screen, Save/Load game progress, and change graphics settings.